Or, as Steve fondly refers to them, “love muffins”. I featured these in last week’s post on easy, meatless, make ahead breakfasts, but after taking some proper photos that finally, I think, do their perfection justice, I have to give them their own post. Now, I could milk this for about ten different recipes, because they’re so dang versatile. You get 1 1/2 cups of whatever fruit, nuts, chocolate, or crazy fillings you can think up–the sky’s the limit. Since you’re creative enough to try out different variations and I have a huge lineup of other recipes I’m trying to share as fast as possible, I decided to go the efficient route and give you the basic formula here, with some suggestions to get you started. Exhibit A: the version in (most of) the photos are cherry (from frozen fruit) and toasted walnut (from the dog food sized bag I just got at Costco). Exhibit B: I made a separate batch at the same time of chocolate chip and toasted walnut for Stevie, because he won’t touch any food ending in “-erry” with a 10 foot pole. 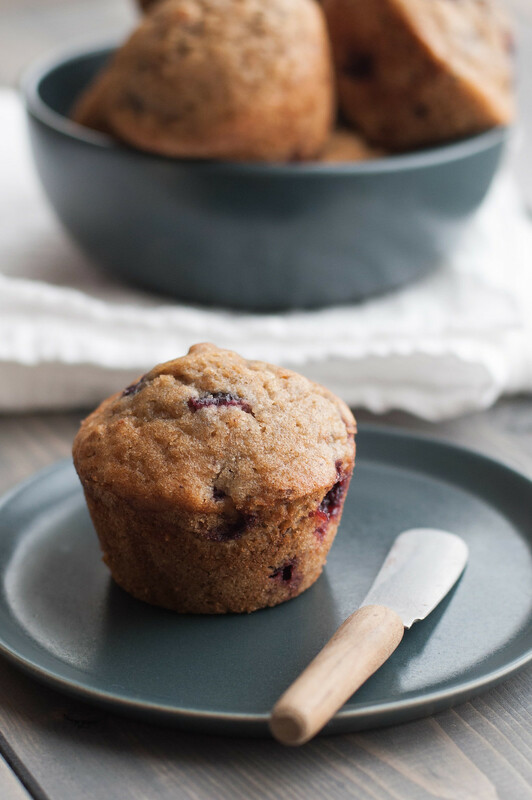 These clearly aren’t some miraculous six ingredient gluten free muffin recipe, but once you purchase the increasingly easy-to-find ingredients, it becomes a habit to keep them stocked. When I started baking gluten free, I bought a lot of my ingredients on Amazon, and that’s definitely the way to go if you live far from a health food store or grocery store with a decent natural food selection. It can also be more cost effective, but I’ve noticed more and more of the ingredients appearing at Whole Foods, or even more conventional grocery stores, at reasonable prices. Usually I buy it once at the store and come home and compare to Amazon prices, to make sure I’m not throwing money away. Money that I could be spending on things like…cheese. Lots of cheese. 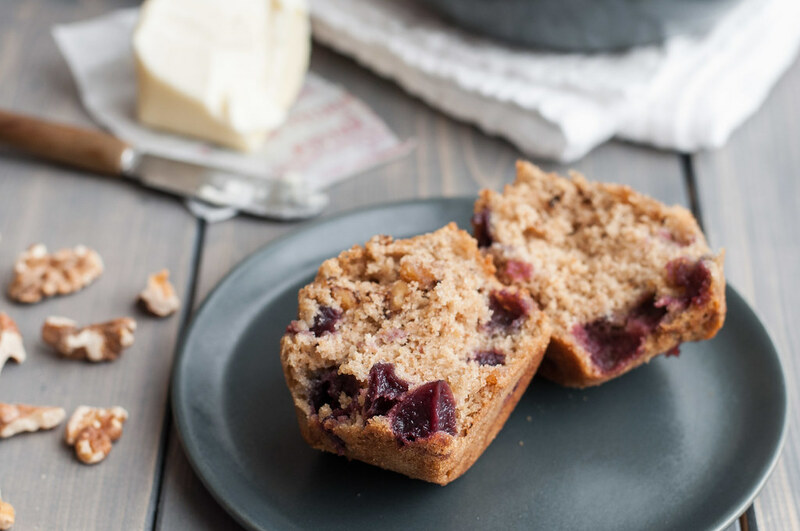 Unlike most of their six ingredient counterparts, these muffins are super dense and hearty. No, not teeth-breaking or rock solid, just talented at disguising their gluten free claim to fame. For years, my favorite muffin at Caribou Coffee was this low-fat peach and blackberry muffin which probably weighed about a pound. I’m not so sure how low in fat it actually was (nor would I care these days), but it did the job of replenishing my stores after my dad and I went out for a road bike ride before church on Sundays. I so looked forward to that muffin and it’s big puffy top! And a mocha banana smoothie, which, sadly, was retired long ago. Any Caribou fans remember those? Sooooo thick and creamy and delicious. But the muffin–just sweet enough and so doughy it was a miracle that the top rose so high. Then every so often I’d bite into a big juicy whole blackberry just tart enough to keep things exciting. If I had to compare these gluten free muffins to a muffin from my past, it would be that glorious Caribou pastry (sorry Panera). In one week, when I’m walking off a plane and into the not-yet-frozen tundra of Minneapolis, Caribou will be my first stop, before I even exit the airport. It’s one of my favorite (food) things about going back home. Dunkin’ Donuts is just something I’ve never been able to get behind. There’s no way those donuts are homemade, and they add the cream to your coffee for you, usually turning it a shade of slightly tinted white. Cream with a splash of coffee. Plus, and I am likely biased, I find Caribou to just have the homiest atmosphere with the fire going and log cabin feel (maybe it’s the hundreds of hours I spent there studying for my CPA exam). Cannot wait. Unfortunately, getting my hands on a Caribou chocolate cooler while doing some sales tax-free shopping at the Mall [of America] means that my honey and I will be spending our first Christmas as an engaged couple apart. This week, I’m attempting to compensate by packing the fridge and freezer with ready-to-eat dinners, and a few snacks. With a week ’til I leave, a dress for Tor’s wedding still to be found(! ), Steve’s holiday party Thursday night in NYC, some Christmas-y things to wrap up (no pun intended), and our friend Dave visiting from Palm Beach starting Thursday night, I got a little stressed making my grocery list last night. 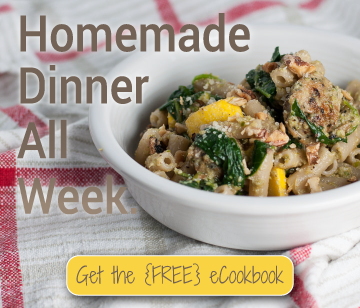 Planning dinners for the week and making separate dishes for Steve to eat next week is not going to fit into my remaining days in Connecticut, so I’m doubling or tripling freezer friendly dinners all. week. long. Sound excessive? On top of feeding Stevie for six days, we’re going to come home January 5th to a new year in Connecticut, and I can tell you grocery shopping is not the first thing I’ll want to do. Cooking? Totally fine with jumping back into that, but just the thought of organizing my grocery list and heading out for two hours of heavy shopping after getting out of a plane merits a nap. 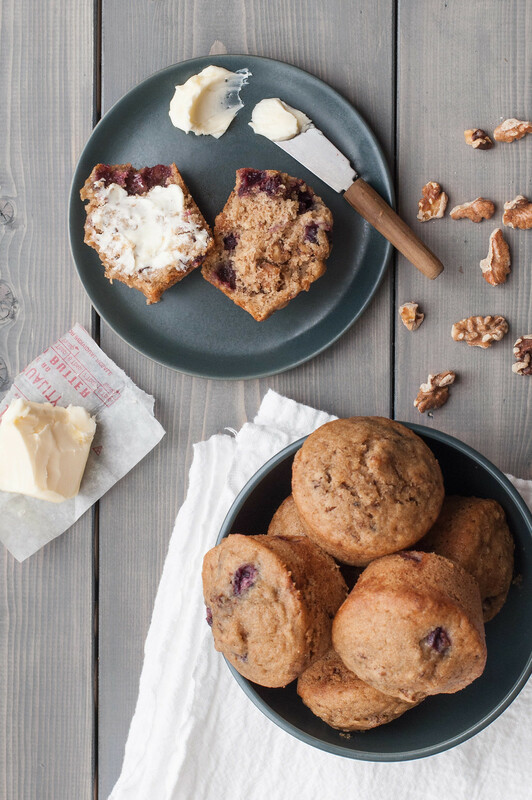 These muffins thrive in the freezer, so they’ll make for quick breakfasts for Steve on his way to work next week. I wrap them individually in plastic no more than three days after they bake, then thaw at room temperature overnight. If you forget to take one out of the freezer, no big deal. Loosen the plastic a bit so it doesn’t melt together or to the muffin, and microwave in 30 second intervals at 60% power until warm. Swipe with a little butter, vegan spread (surprisingly tasty), or apple butter, and you’re on your way, with breakfast. 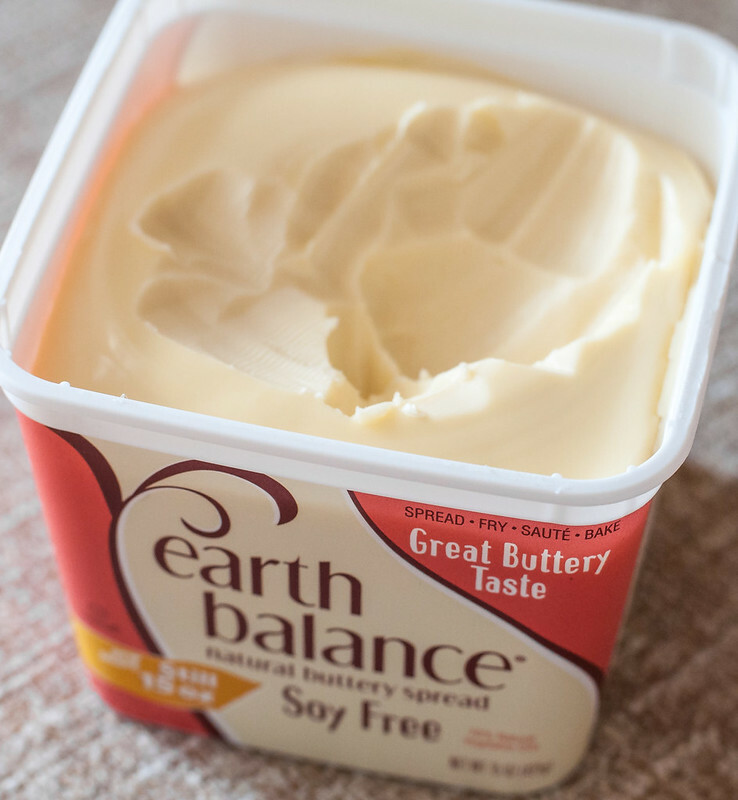 Don't take the Earth Balance or butter out of the refrigerator until just before needed--it should be as cold as possible. Cut frozen fruit mix-ins into blueberry sized pieces, then freeze again until just before needed. Preheat oven to 350 degrees (F). Grease standard size nonstick muffin tin with extra Earth Balance, or line with muffin liners. Whisk dry ingredients (everything through the salt) together in the bowl of an electric mixer. Measure the cold Earth Balance, then use a butter knife to drop into dry ingredients in pea to blueberry sized pieces, stirring with a spoon to coat the pieces in dry ingredients when done. 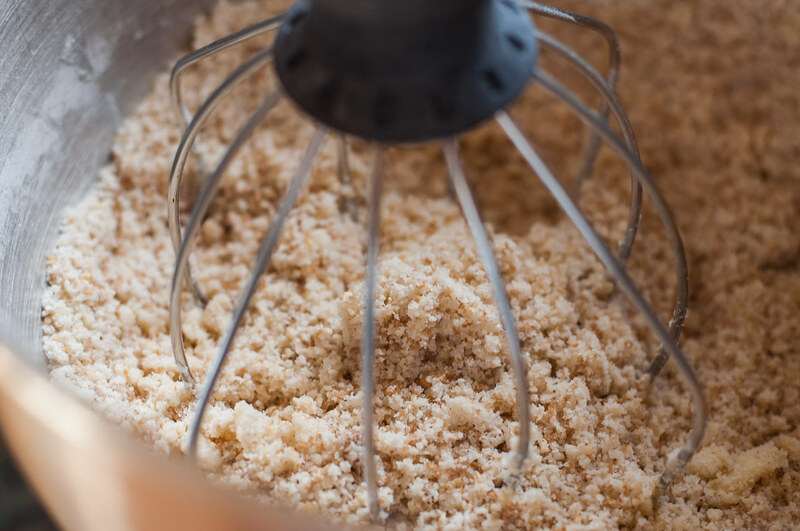 Then whisk on low speed until the mixture resembles coarse, moist crumbs. It shouldn't be completely blended. Add eggs, almond milk, vanilla, and cinnamon. Using the paddle attachment (not the whisk), mix on medium speed until just combined. 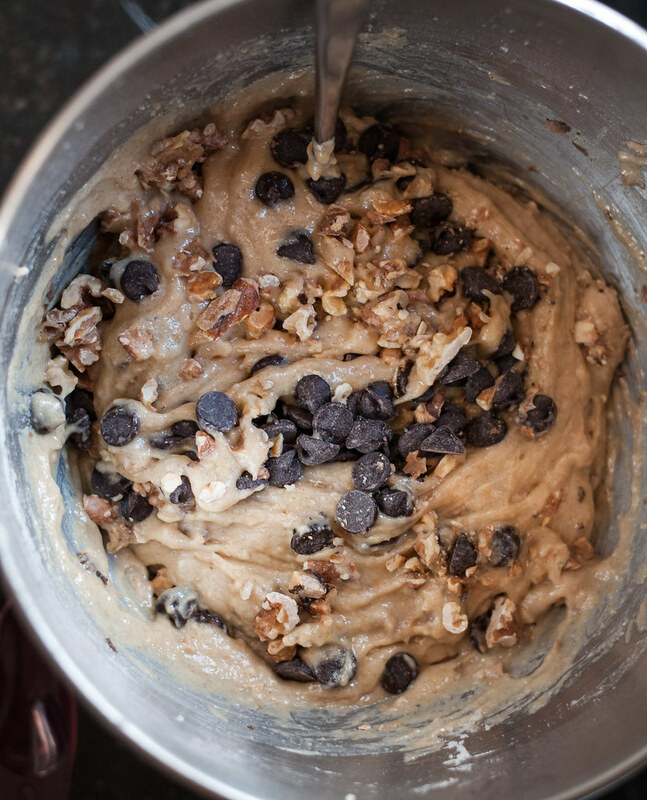 Fold in mix-ins with a large spoon or rubber spatula. Distribute batter evenly amongst muffin tin wells--each will be quite full. Bake 22 to 25 minutes. Baking time will be on the longer side if using frozen fruit. Muffins are done when no more than slightly golden and they spring back when lightly pressed with finger. 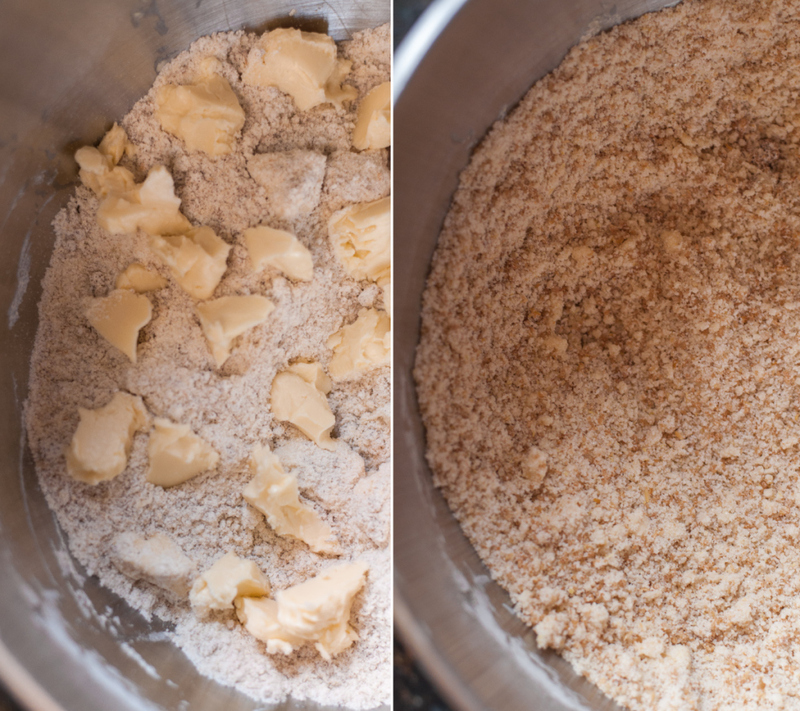 I rarely use a full ½ cup cane sugar or packed brown sugar in this recipe, and I haven't weighed an exact about. 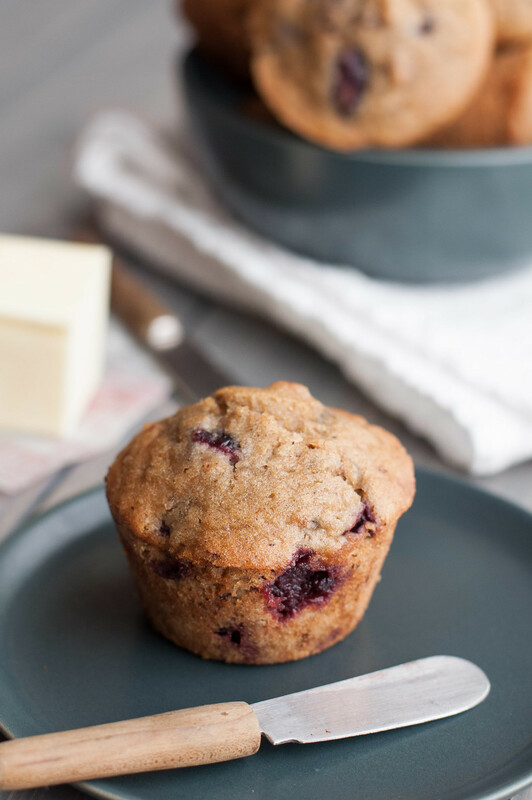 Using up to 2 tablespoons short of ½ cup of either or both sugars won't affect the consistency of the muffins if you prefer less sugar for taste or health reasons. Store the muffins at room temperature for a couple days, move them to the fridge for a couple more days, then freeze them if keeping longer. 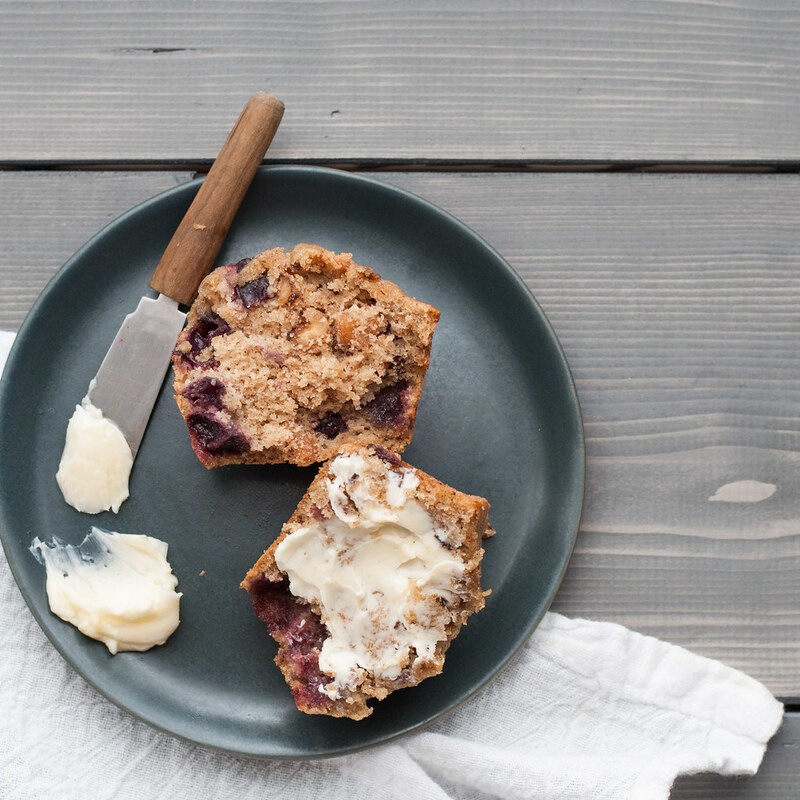 Alternately, you can completely cool the muffins after baking and immediately freeze them. Take out the night before to thaw, or microwave loosely wrapped in a paper towel at medium power in 30 second intervals. When freezing or refrigerating, individually wrap in plastic wrap or airtight wrap of your choice. Adapted from lemon-blueberry muffins by Gluten-Free Goddess Recipes. I can never go past a good home-baked muffin. You definitely have got me craving a batch of these right about now.. pinned!